As I have mentioned a few times, I am a planner. I like to know where I am going and have an idea of what to expect. This post is about going, rather blindly, along with the flow. Our trip was planned by others, and the plan changed more than once, to the point where we went to bed the night before only knowing that someone was to pick us up at 8 am the next morning. James didn’t know which of the people he knew were going to be picking us up, and we didn’t know where we were going. Sunny posing for a picture taken by her dad. It turned out to be the family of one of his students, a little cutie named Sunny. He knew her parents and had been to Mount Tai with them and some others last summer. In the car we learned that we were going to a national park called Yishan and it would take about two hours of driving to get there. It was not until I got home and was able to plot the GPS data from the pictures I took that I was able to figure out where Yishan is: southwest of Weifang, almost as far south as Qingdao but to the west of it. Although Yishan is not oriented to westerners many of the signs have English explanations. I used photos I took of the signs and sights to piece together a better idea of what I saw than I had at the time I was seeing it. Yi Shan as a national park struck me as new. The entrance, visible in the picture through the windshield was fairly new and there was a lot of construction going on, including what looked like a large hotel pretty far up the mountain. That could be a very nice place to stay when it is done. The views will be terrific. I wonder how hard the beds will be. Even though the park buildings are new there are temples and features that are very old. You take a shuttle bus up from the main entrance area to the start of a series of stairways, to the Jade Emperor Pavilion at the summit of Yi Shan. You walk up from here. View looking to the top from the bus stop. On the way up I noticed that people had put stones in the trees. I asked our host and, after consulting his cell phone, he said that they are for blessings. The walk up and the summit had nice views out in many directions. It was over cast and just a bit hazy, much less hazy than it had been the previous weekend at Tai Shan. Apparently, when it is very clear you can see to the sea from the top of Yishan. It wasn’t very clear but the views were nice. View along path to Jade Emperor Peak. View near the top of Jade Emperor Peak. The Jade Emperor Pavilion at the top is a charming temple. Less majestic in scale than many but it has many ornate details and is well maintained. I am not sure what is the significance of this rock, but it was the place to get your picture taken. My son and I at “the rock”. You then slide down a granite slide on your backside. This is not my type of activity, but I could see that it would take all day to walk back down all the stairs we had climbed. So I tied on my seat cover donned my gloves and sat down. I didn’t go very fast for fear of losing control. The way to control your speed is to push your feet against the sides of the slide. Even though I wouldn’t have signed up for the experience it was an efficient way to get down and I would probably go a little faster next time. It was fun once I started to get the hang of it. At the Dongzhen temple they did a reenactment of an imperial rite. 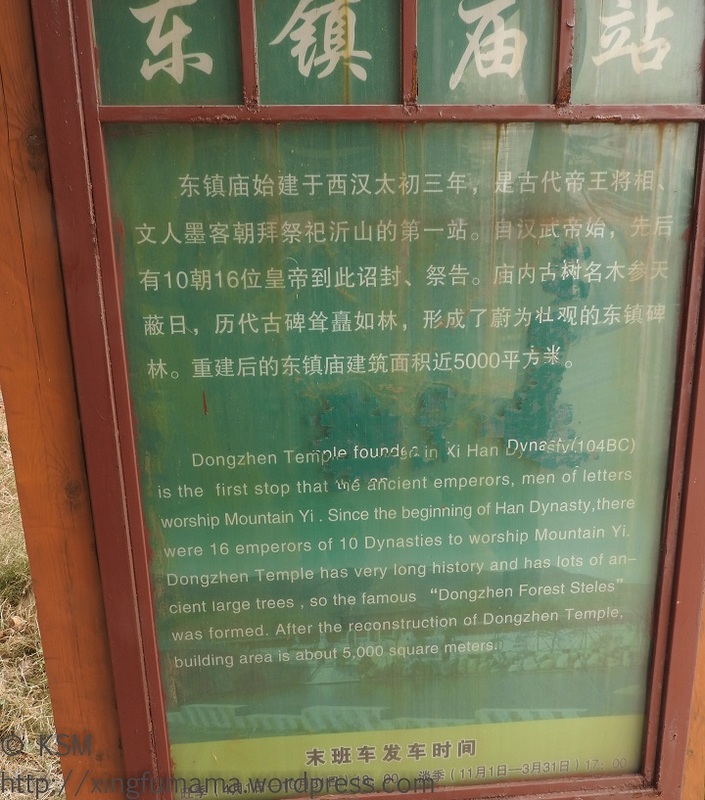 The main temple is quite new, in fact they were still painting the entrance gate red, but there are some very old trees, an altar and a bixi (giant stone tortoise with a stele on its back) that are very old. This sign explains a bit, but after trying to find information online and reading the signs, I couldn’t totally figure out what was what beyond that the altar, some trees and the bixi are quite ancient and that the temple, in fact the whole site is a sort of seaside Mount Tai and that some emperors came here either in addition to or instead of there. The Dongzhen temple is analogous to the Dai Miao in Tai’an. Regardless of my lack of understanding, it was a great day enjoying the scenery and culture in China. Stuff I couldn’t have planned since I knew nothing about their existence and wouldn’t have dared to try if I knew about it ahead of time.